Surprisingly, Haemimont Games, known mainly for their strategy games and as well as for creating Tropico 3 and Tropico 4 released in 2011, and The First Templar, the action game and cooperative role with the devil that did not work very well, but let us glimpse that the studio wanted to do new things, and that this genre might be one of those that they wanted to explore. Victor Vran was launched some time ago in the program early access by Steam and after spending a few months it finally gives its final version, although we are confident that, as usual today, it will continue to expand and improve in the future. 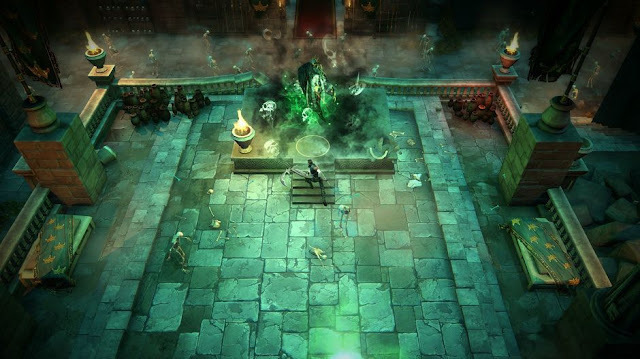 Victor Vran is a game of action and role of aerial perspective and a small component of platforms reminiscent of titles like Diablo saga or the The Incredible Adventures of Van Helsing saga, also shared with the game setting. In it we are going to Zagoravia where we get into the skin of the character who gives name to the game, who must battle a demonic invasion that threatens this fictional city. Unlike other titles, Victor Vran is simple, direct and accessible, but not skimp on depth for those who seek it. The combat system is fairly straightforward, with great emphasis on attack and dodge, but we will have to define our style through special skills and passive. Victor Vran doesn’t have classes, but after a couple of hours of gameplay the character that we have done is ours. Victor Vran up for its lack of classes with a team that profoundly alters the gameplay possibilities. Only change weapon and we can play in a completely different way, having to set the pace of combat differently, dosing special attacks at a different pace, and, among many quotes, making it look even a different game. Besides, we can assign two "letters" to the character that will give passive skills. In this adventure, exploration is also very important. There are plenty of hidden areas in which rewards await us as useful, often hidden behind a jump that gives platformer is tiny touch we mentioned earlier. Obviously, it's not a Super Mario, but sometimes taking a risk is rewarded. This reminds us that Victor Vran is a fairly permissive title, and die virtually pose no penalty, which, if any, would have given more stress to the experience. A great attraction, of course, is its cooperative multiplayer mode for up to four simultaneous players. Unfortunately we could only try to strangers, and needless to say that the experience left feeling a little in the hands of chance. Still, we liked a lot, and we think that friends have to win a lot, lot worse, particularly if you enjoy this kind of games. In any respect, it is a very well designed, with simple menus to navigate, beautifully executed scenes and a very well explained gameplay. Perhaps the crafting system is the one that is shorter in this respect, and it is where we have to put more of us. The experience, overall, it is very enjoyable and even replayable, and allow us to go back to get more experience and gold through secondary objectives, which is quite appreciated considering that there is a particularly long adventure; in about six or seven. On the one hand, commenting that in the audiovisual, Victor Vran is a very correct game, without emphasizing too much on anything, it does everything pretty well. Perhaps its sense of humor can amuse or bore, although we have found it is well measured and somewhat discreet seasoned history. Video sequences are slightly animated. After several hours of play everything becomes very mechanical, and after we were finished it with little time to note. This does not mean it becomes boring, but some might say that it is memorable. Victor Vran is a good title that have spent a good time with friends and enjoying much better. If you are craving a role-playing game Diablo-style action without many complications, the Haemimont’s new game meets, but unfortunately the adventure has seemed somewhat flat, with some memorable moments could have left a better taste. It certainly has some things to improve, but the experience is fun.